The leaves are falling and a chill is in the air. 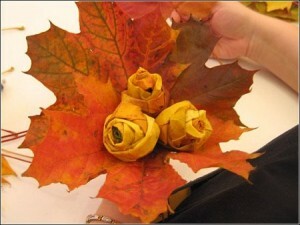 Autumn weddings are in full swing as Halloween is now over and Thanksgiving quickly approaches. Warm fall weddings often feature warm red and gold colors, pretty bits of nature at its best like leaves and pumpkins… What else do you need? Well how about adding an autumn themed signature drink to your big event? 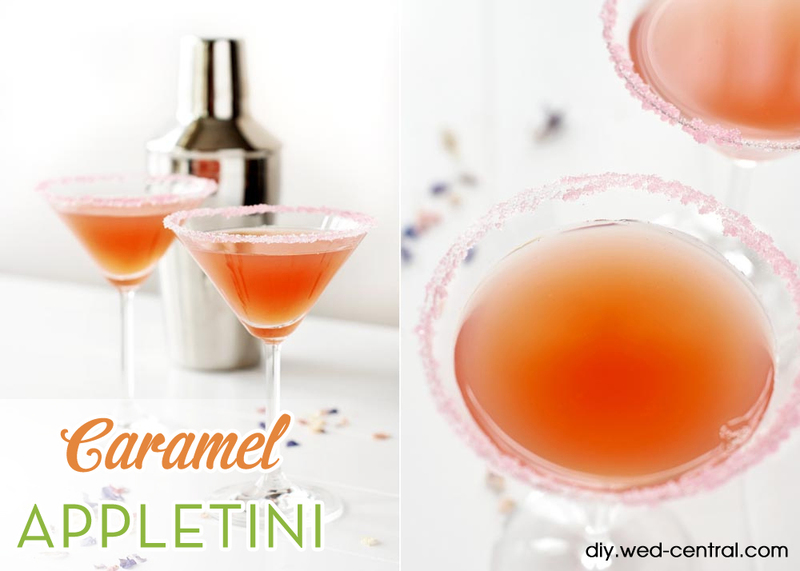 Martinis are always a big hit for weddings and parties, so a “Caramel Appletini” or a “Pumpkin Pie Martini” would be fantastic for your event! 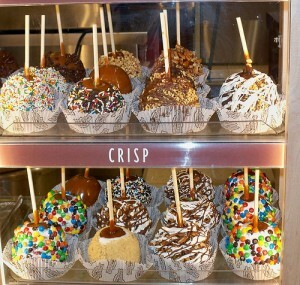 Caramel apples are so delicious.. How could you go wrong making it into an adult beverage instead?? Shake Baileys, vodka and caramel in an ice-filled shaker until chilled. Nothing says fall like pumpkin pie. 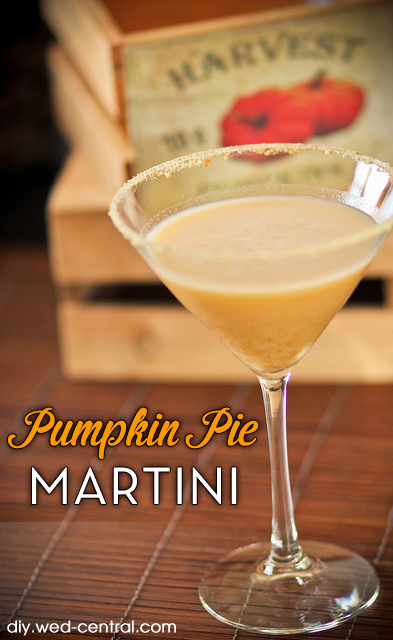 With this delicious fall themed martini your guests can enjoy the taste of autumn and still mingle! If desired rim your martini glass with ground graham cracker. Combine ingredients in a cocktail shaker half filled with ice. Shake until chilled and pour into your chilled martini glass. These autumn signature drinks would add fall flavor to any autumn themed wedding or party. Your guests will love how you turned two fall favorites into yummy drinks instead! Food is the perfect wedding favor (it never goes to waste! 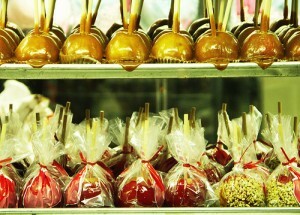 ), and what would be more perfect for an edible wedding favor in the fall than do it yourself homemade candy apple favors? These yummy chocolate caramel covered apples will leave your guests drooling when they see them at your place setting, and they are quite darling wrapped in cellophane with a colored bow to match your theme! You can even attach little tags with your names, wedding date..even your personalized monogram! They are so easy to make and can be customized in so many different ways to create a delicious favor all your own. Bring a pot of water to a boil and dip each apple in briefly to remove any wax that may be on the skin from the grocery store. 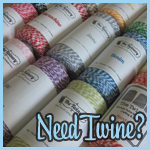 Wipe dry and let cool. 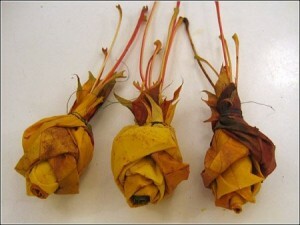 Insert craft/popsicle sticks into each apple, through their core. Line a baking sheet with wax paper and spray with cooking spray to prepare a place for your apples to cool. Melt unwrapped caramels in a microwave safe bowl in the microwave with the two tablespoons of water. Cook on high two minutes, stir (be careful it gets hot! ), and continue heating and then stirring in one minute intervals until the caramel is completely melted. Holding each apple by the stick, gently dip each apple into the melted caramel and then carefully transfer it to the wax paper you prepared earlier. 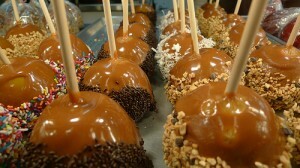 If you are going to be dipping your apples into chocolate, refrigerate for 15 minutes. If you are only dipping your apples in the caramel skip ahead to step 7 to coat your treat with nuts, chopped candies or sprinkles instead of allowing to dry and then refrigerate to set. Next, heat chocolate in a microwave safe bowl in the microwave with the tablespoon of shortening until melted and smooth. Dip each caramel coated apple into the melted chocolate to cover the caramel and then hold apple over the bowl allow the excess chocolate to drip off. Once you have allowed the extra chocolate to drip off, gently roll in the chopped nuts, sprinkles or chopped candies you chose to decorate your apple treats. Set on wax paper and allow to set (If you skipped chocolate, it’s best to set your apple in the refrigerator)…and you’re done! My previous post I featured a project by David Monn, an event designer featured on Martha Stewart. 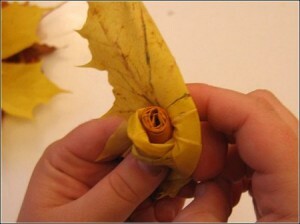 This is another fantastic autumn project he created that would add some warm autumn colors from an unexpected place! Sure, you have autumn florals and centerpieces..but how about some fall decor cascading from the ceiling? These Cascading autumn leaves are extremely affordable and easy to create and would look stunning in a number of places on your wedding day! Hanging around doorways, above tables or maybe just above the cake table to make your autumn wedding confection pop out even more! Let’s get started! 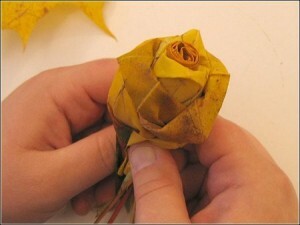 Now is to create these dandgling beauties! 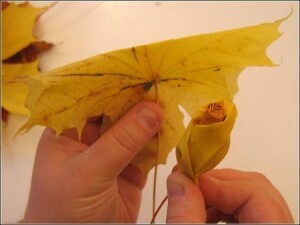 Take your monofilament and cut it into lengths you want the cascading leaf strands to be. Make them as long or short as you wish! 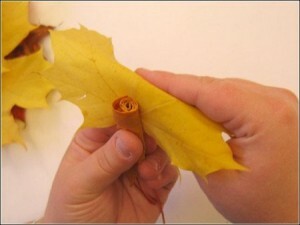 Mark the monofilament with a pencil where you want each leaf to be spaced on the strand. 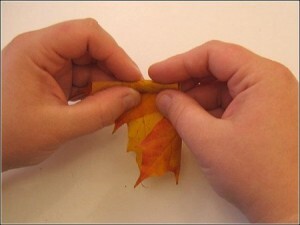 Place a spot of glue in the center of a leaf, and then attach it to the monofilament strand where you made your mark. 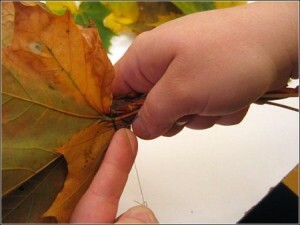 Add another spot of glue on the leaf now glued to the monofilament and push another leaf on top. 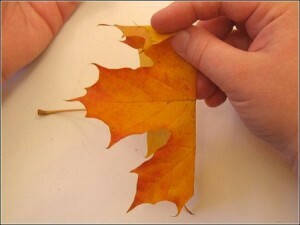 Double facing the leaves will hide the spots of glue used when attaching! 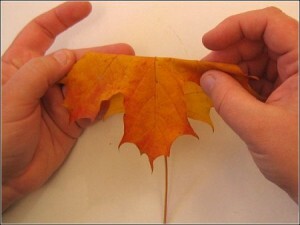 Repeat gluing 2 leaves on each premarked spot on your monofilament strand until each mark is covered. That’s it! make as many strands as you wish and hang them at your ceremony/reception site to add rich natural warm colors of autumn from an unexpected place – the ceiling! 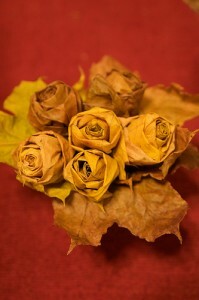 I think they are an absolutely perfect add on to your fall wedding decor..Every little detail personalizes your big day! 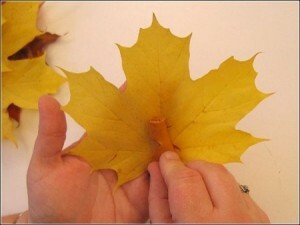 Make sure you send in your pics if you use these leaf cascades at your wedding! 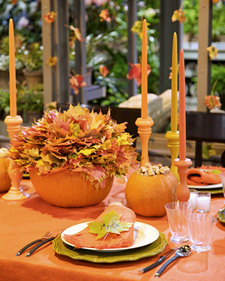 David Monn (a Nyc event designer) was on the Martha Stewart yesterday and he did a wonderful presentation of easy fall table decor that I thought would also work beautifully in some cases for a fall themed wedding! 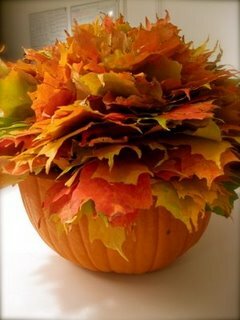 One of his wonderful creations was a perfect autumn centerpiece, a pumpkin filled with colorful autumn leaves. 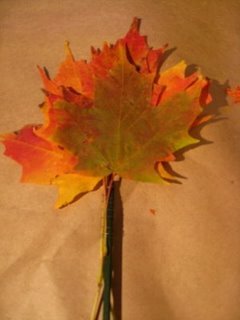 It’s an extremely easy centerpiece to assemble, and also extremely affordable this time of year – especially if you have rich autumn leaves laying all over your yard or park that can be used for free! 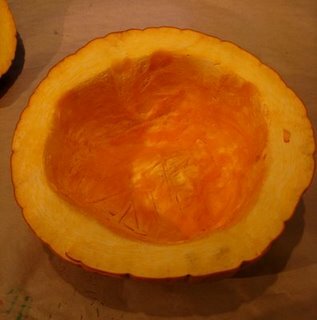 Cut your pumpkin in half, scoop out the seeds and carve your pumpkin into a bowl. 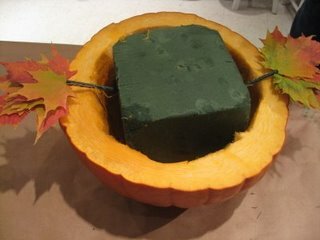 Cut your floral foam to fit inside your pumpkin bowl and push into your pumpkin. 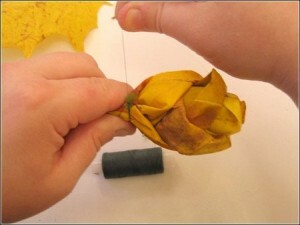 Attach five leaves of different sizes to a floral stick using floral wire to form a branch. 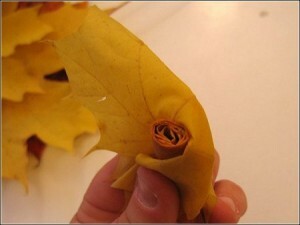 Push your branch into your floral foam and repeat until the foam is completely covered. 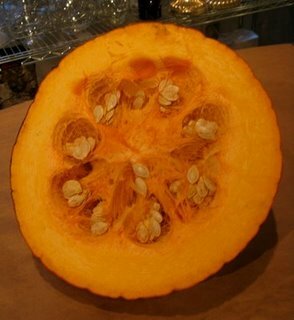 You will end up with a pumpkin bowl with an overflowing colorful abundance of crisp leaves. Now just repeat as needed until you have the number of centerpieces needed for your reception! 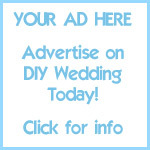 These would also look beautiful as randomly placed decor throughout your ceremony and reception. Maybe place one near the guest book, or a couple around your altar! 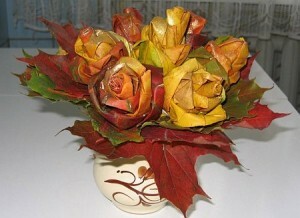 It would bring the beautiful crisp autumn colors into your big day to compliment a wonderful fall theme. 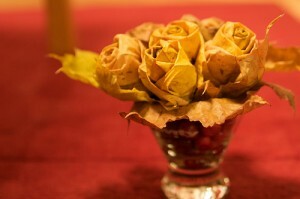 Credit: Martha Stewart and David Monn for the idea and images!